Perhaps it was the novelty of the rare Sunday afternoon kick-off at the Regional Sports Centre, but it probably had more to with the dull fare on the pitch that the biggest cheers in the opening 70 minutes yesterday were reserved for announcements of birthdays, weddings and raffle winners. Third-placed Waterford up against a Shamrock Rovers side just 48 hours off a plane from Sweden following extra-time in their Europa League tie, won't be remembered as one of the season's classics. 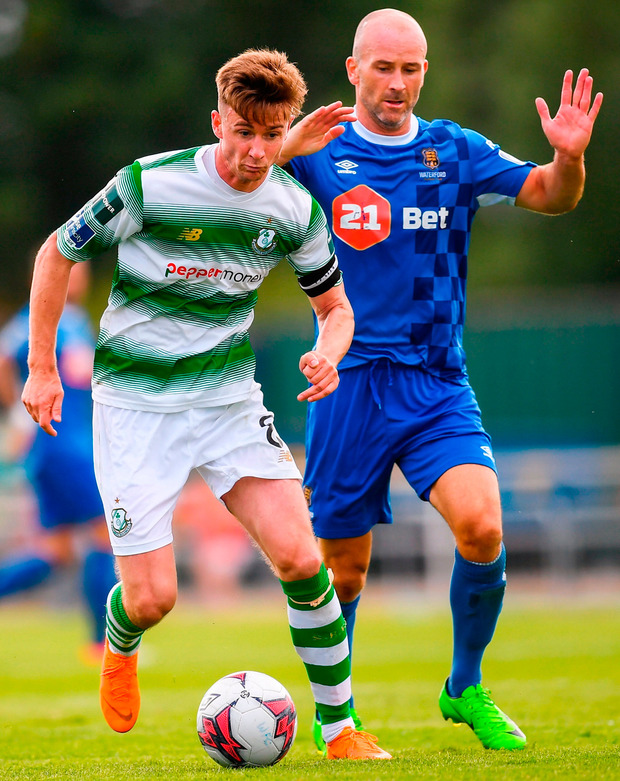 Stephen Bradley doesn't mind, though, as substitute Gary Shaw's first goal of the season with 15 minutes left sealed a win which shunts them just four points off Waterford with 10 games remaining. In an era when Rovers remain envious observers of the Dundalk/Cork City duopoly at the summit, qualification for Europe is the minimum target and, apart from lifting a first FAI Cup for 31 years, only a third-placed finish will guarantee that. The introduction of forgotten man Shaw may be recalled in time as being pivotal to achieving that mission. With the game evenly poised on 63 minutes, the 26-year-old and fellow attacker Aaron Greene were thrust into the fray. 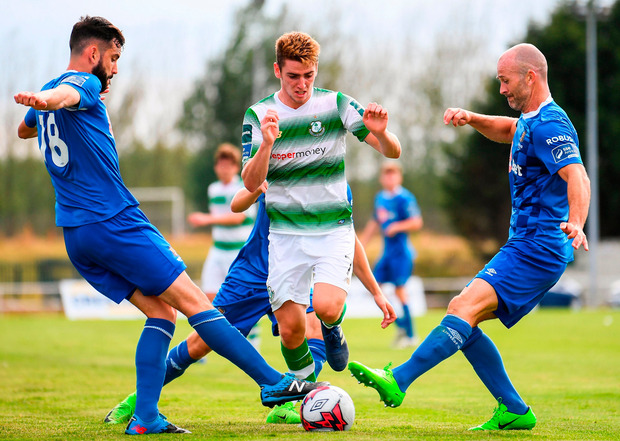 By his own admission, this has been the most challenging of the three seasons Shaw has spent at Tallaght, acting as second, or sometimes third, fiddle behind Daniel Carr as Bradley's striker of choice. Shaw had nearly been robbed of his redemptive moment. He was left groggy from an aerial challenge, with Rovers preparing to withdraw him and play the remainder with 10 men, but he more than recovered to utilise his neck muscles. When Waterford failed to clear a corner, the ball eventually found its way to Sam Bone on the right. The substitute was afforded the time and space to swing in a cross to the unmarked Shaw, who flung himself at pace in executing a diving header past Matt Connor. Alan Mannus, who replaced injured teenager Gavin Bazunu for his competitive debut after returning from St Johnstone, had four minutes earlier denied both Gavan Holohan and Izzy Akinade with a double save. It was the decision of referee Rob Harvey, however, to wave appeals for a penalty midway though the first-half for a shove on Ikinade which most incensed Blues manager Alan Reynolds. "It was a stonewall penalty," he sighed afterwards. WATERFORD - M Connor; R Feely, K Browne, D Webster, D Barnett; P Keegan; S Aborah (S Puri 85), G Holohan (D Hutchinson 82), B Héry; I Ikinade, C Duffus (N Hunt 65). 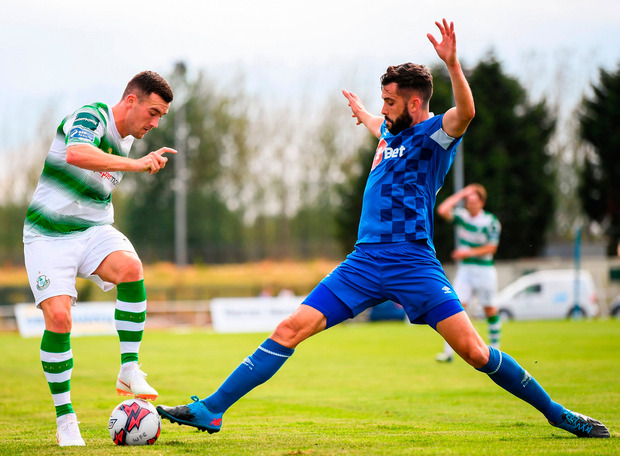 SHAMROCK ROVERS - A Mannus; E Boyle (S Bone 13), L Grace, R Lopes, L Byrne; G Bolger, D Watts; J Coustrain, R Finn, B Kavanagh (A Greene 63); D Carr (G Shaw 63). Ref - Rob Harvey (Dublin).